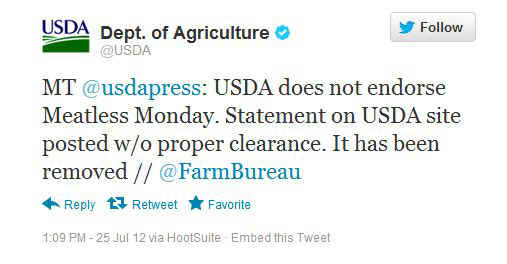 Keeping that in mind, it’s not a stretch to think that the USDA could (and should!) support Meatless Mondays. Following a plant-based diet, even on a very part-time basis, helps increase vegetable intake (to strengthen rural communities), is good for the earth (to protect and conserve our natural resources) and can drastically improve one’s health (to provide a safe, sufficient, and nutritious food supply for the American people). In a recent internal USDA Greening Headquarters Update, the agency took the opportunity to inform readers about green initiatives taking place in its cafeteria. 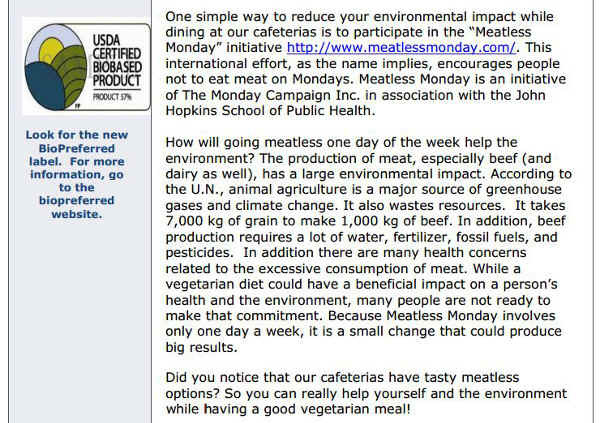 To the “many USDA employees” and “thousands of tourists and visitors” who dine at the agency’s cafeteria each month, the newsletter recommended they help Mother Earth by participating in Meatless Mondays. One simple way to reduce your environmental impact while dining at our cafeterias is to participate in the “Meatless Monday” initiative http://www.meatlessmonday.com/. This international effort, as the name implies, encourages people not to eat meat on Mondays. Meatless Monday is an initiative of The Monday Campaign Inc. in association with the John Hopkins School of Public Health. It's quite telling that the Ag industry is so worried about Meatless Mondays. In all actuality, vegetarians and vegans, while growing, still make up such a small segment of our society. These organizations obviously know the harm they are causing to our planet and to the health of consumers... and they must realize that one day, the atrocities that take place on farms around the country will no longer be tolerated. Daelyn is the co-founder and managing director of This Dish Is Veg. She handles the daily operations of the site including advertising, story idea generation, and website promotion as well as managing the volunteer contributors. Along with her work at TDIV, Daelyn is an editor for a gift-giving website and mother of three daughters.